BOOM! 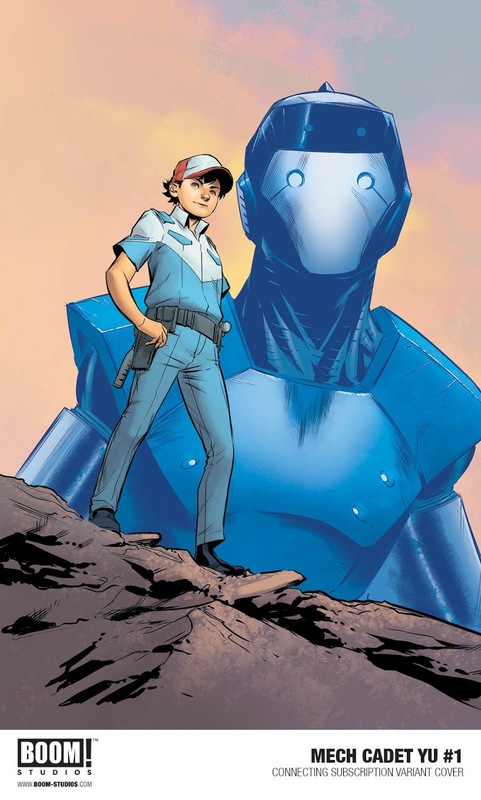 Studios is thrilled to announce MECH CADET YU, a new monthly series launching in August from longtime collaborators Greg Pak (The Incredible Hulk, War Machine) and Takeshi Miyazawa (Ms. Marvel, Runaways). The pair has worked together in the past on projects like Code Monkey Save World and ABC Disgusting, and are widely known for the creation of Amadeus Cho, who would eventually star in Marvel’s Totally Awesome Hulk. 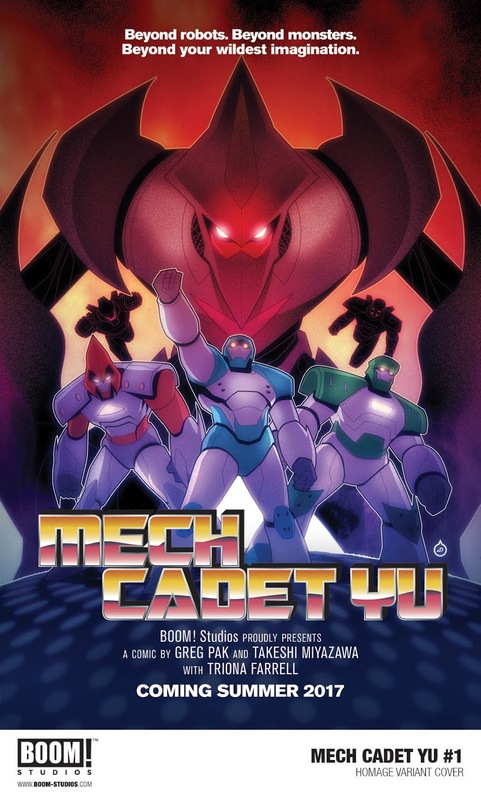 Mech Cadet Yu is the story of Stanford Yu, a young janitor who is unexpectedly chosen to join the sacred ranks of the mech cadets at Sky Corps Academy. Once a year, giant robots from outer space come to Earth to bond with the cadets to defend the world from terrifying aliens known as the Sharg. After he unintentionally bonds with his robot, Yu is thrown into training, hoping to prove he is worthy of being there at all. 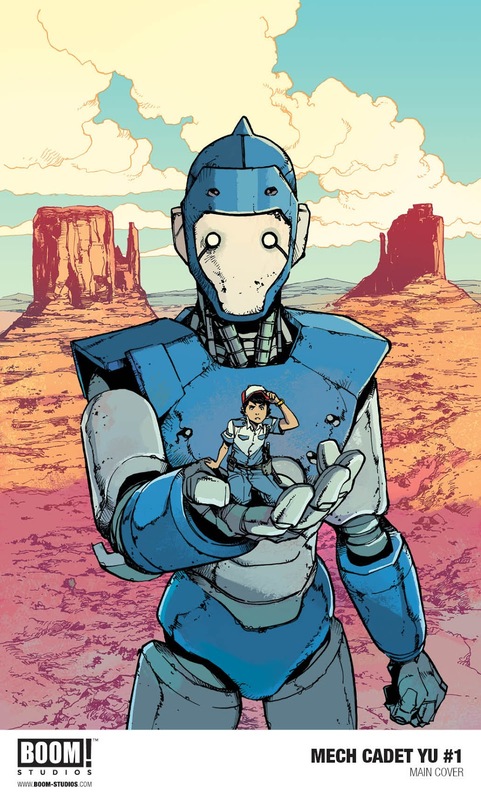 Mech Cadet Yu #1 features covers by Miyazawa, Marcus To (Joyride), and Juan Doe (Uncanny X-Men). In August, print copies of Mech Cadet Yu #1 will be available for sale at local comic book shops (use comicshoplocator.com to find the nearest one) or at the BOOM! webstore. Digital copies will be available to purchase on digital book marketplaces, including ComiXology and the BOOM! Studios app. Mech Cadet Yu is the latest release from BOOM! Studios’ eponymous imprint, home to a world-class group of licensed comic book series and ambitious original series, including Mighty Morphin Power Rangers, WWE, Big Trouble in Little China, Victor LaValle’s Destroyer, Godshaper, Grass Kings, and Klaus. For news on Mech Cadet Yu and more from BOOM! Studios, stay tuned to www.boom-studios.com and follow @boomstudios on Twitter.